At the annual meeting on April 13, 2019 new officers and board members were elected. Congratulations to the following new leaders, and let’s support them in the upcoming Russian Heritage activities. ZHANNA THOMAS; ZHENYA DAVENPORT; MARY STENOV; ZINA DOWNEN. 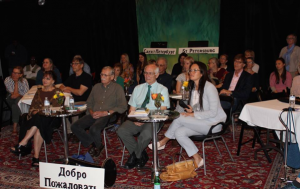 SAM MANDELBAUM; INNA RUEFLE; JULIA RADIVILOVA. NATALIYA SCARBERRY has one year remaining of her two-year term. 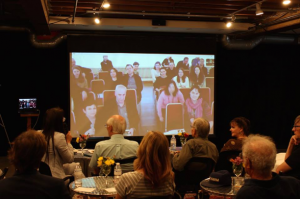 We would like to thank everybody who attended the historic first video simulcast today and opening the dialogue between Two St.Petersburgs as part of Sister Cities program. 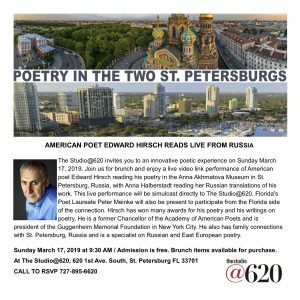 Our special thanks go to The Studio@620 for the hospitality, for providing food and technical support of the video conference, Anna Akhmatova Museum in St.Petersburg, Russia, Edward Hirsch, Anna Halberstadt, Peter Meinke and Helen Wallace for their presentations , sharing their talents and poetry and for being true cultural people-to-people diplomats. On Friday, February 8, 2019, poet and translator Lydia Razran Stone will present her translations of Ivan Krylov’s “Fables” at the Main Library in St. Petersburg, Florida (3745 9thAvenue N.)at 4:00 pm. This program is free and open to the public. Lydia Stone has translated 62 of Krylov’s Fables, and published them in her book The Frogs Who Begged for a Tsar. 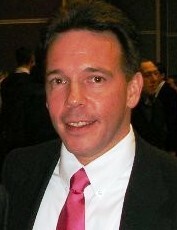 (Russia Life Books, 2010). On Saturday, February 9 she will speak on the art of translating Russian poetry into English, with examples from nineteenth and twentieth century Russian poets, as well as Krylov, a program which will include a workshop devoted to the translation of Russian verse. 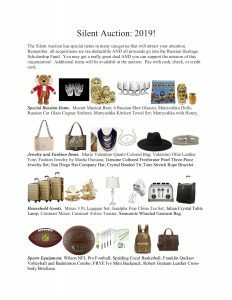 This program is intended primarily for people who know Russian and English well, and are interested in the art of translation, and will be held in the Russian American Club (2920 Beach Blvd. S, in Gulfport) Fee for this program is $10.00. Lydia Razran Stone is an accomplished translator of Russian poetry for Russian Life Magazine and has been the editor of SlavFile, a quarterly for Slavic translators for the past 15 years. Lydia Razran Stone has an MA in Russian languages and literatures and a Ph.D. in cognitive psychology. She has been ATA certified for Russian to English translation in 1983. Her most prolonged assignment as a technical translator involved 10+ years of translating and reporting on space biology and medicine for NASA and editing a 5-volume joint NASA –Russian Academy of Sciences book on the subject. She is proud of starting and frequently MC’s the Literary Division’s poetry reading session. A founding member of the Slavic Language Division she has been the editor of its publication, SlavFile since 1995. She has been translating the poetry for Chteniya (Readings) a quarterly journal of translated Russian literature since its founding, has published poetic translations in a number of other online and print journals, and was the translator of 3 bilingual books of Russian poetry. 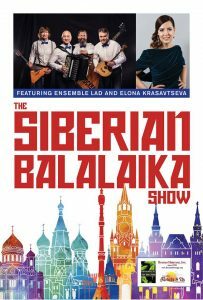 Last Chance for Tickets for Russian Winter Ball! 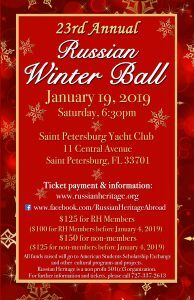 a ticket to the Russian Winter Ball on January 19, 2019!